So much attention is showered on Krampus this time of year, that it’s surprising for many to learn that most Germans aren’t familiar with the Krampus Legend. More common throughout Germany is the Knecht Ruprecht figure. 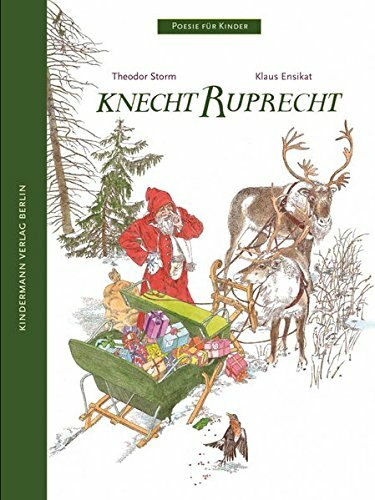 But who is Knecht Ruprecht? Is he a helper? Or a demon? And how does he fit into the St Nicholas tradition? While the concept of Knecht Ruprecht, or Christmas-time ‘Dark Helper’ has been around for centuries, the name Knecht Ruprecht shows up on paper relatively recently. Let me see if I can help you understand this familiar sidekick of St Nicholas. There are various origin stories for Knecht Ruprecht. The word Knecht in German means servant or farmhand. And in a sense, Knecht Ruprecht does act as St Nicholas’s helper, since they travel together, and he does all the heavy lifting. 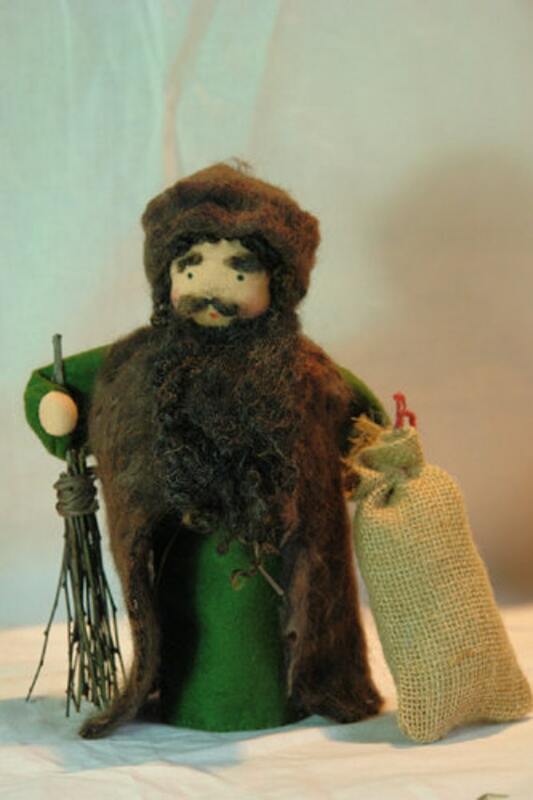 Some say that Knecht Ruprecht was a wounded foundling that St Nicholas rescued and raised. Others say he is a wild man (with HORNS) who comes out of the forest at Christmastime… a dark elf…. to help St Nicholas. 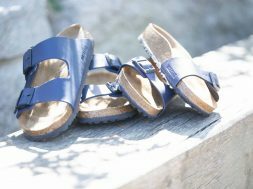 A more obscure legend comes from a story about St Nicholas. St Nicholas arrived at an Inn, and discovered a horrible crime. The Innkeeper had killed 3 boys, and stuffed them into the pickling barrel. St Nicholas brought the boys back to life… and the Innkeeper was punished by being forced to work alongside St Nicholas, as Knecht Ruprecht, for all eternity. Growing up with Knecht Ruprecht. Growing up, I was taught that the Christkind brought gifts on Christmas Eve, and that St Nicholas brought treats on the night of Dec. 5. But, like most German stories, there was an element of danger, or warning. A scary balance to the sweetness and light of the benevolent gift-givers. And that was Knecht Ruprecht. 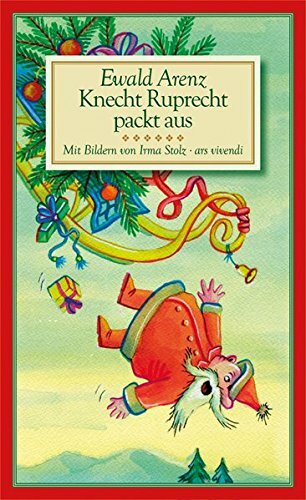 Who is Knecht Ruprecht? He’s a wild man with a bushy beard, dressed in a hooded brown cloak. In his hand he carries a large stick (all the better to beat you with) and at his waist is a child-sized bag… perfect for carrying off kids who have been bad! Some stories say that he has bells tied to his waist so you can hear him coming (I’m convinced that part was added by parents who felt they needed to instill fear, but who didn’t have a costume… they could just get a family friend to ring bells outside). When St Nicholas came to the door on the evening of Dec. 5, Knecht Ruprecht would be by his side… he was the muscle of the operation. St Nicholas would open the big book to see if the devil had written anything bad about you. Then Knecht Ruprecht would make sure that you knew your prayers. If it was a bad year, Knecht Ruprecht would give you a switch or a lump of coal… or worse, stuff you in his sack and take you away! Kids who had been good, and who could recite the Lord’s prayer (and maybe some other verses) would be given apples or nuts as a treat. As an aside… some parents actually frightened their kids by having someone take them away to scare the heck out of them! I’ve read quite a few accounts of people who remember being taken, or having a sibling taken out to the woods for a good scare! I can not imagine that flying with child protective services these days!!! Dark and scary stories are not unusual in Germany. Using threats of dire consequences was the standard way to keep kids in line. Take a look at the original Grimm’s Fairy tales. And remember that Struwwelpeter was written because Heinrich Hoffmann couldn’t find a book for his three year old that had the correct moral teachings. These dark stories come from a time when the world was a scary place. The woods were dark and dangerous, starvation was a reality, and children who messed up could put the whole family at risk. We may see it as unnecessarily frightening, but at the time, it was a way to keep the kids alive. Today, parents still make sure that Knecht Ruprecht visits their children alongside St Nicholas. 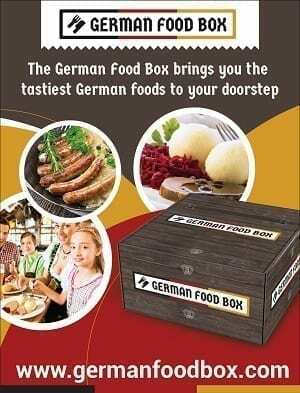 And you can see him at Christmas Markets and Christmas Events around Germany. He may not instill the same terror that Krampus does, but those bells and that stick were certainly enough to keep this kid (mostly) in line during the holidays! ich muss euch sagen, es Weihnachtet seht! Nun sprecht, wie ich’s hier drinnen find! To proclaim that Christmastime is here! now speak, what is there here to be had? Are there good children, are there bad? 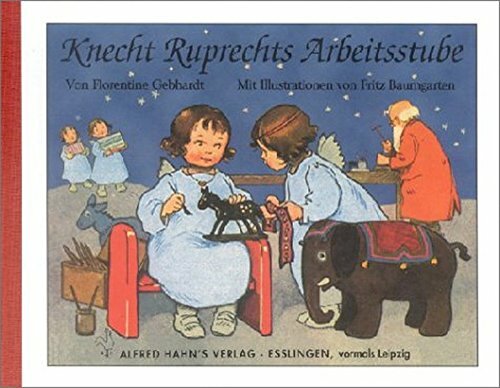 You add these German Knecht Ruprecht stories to your bedtime reading. 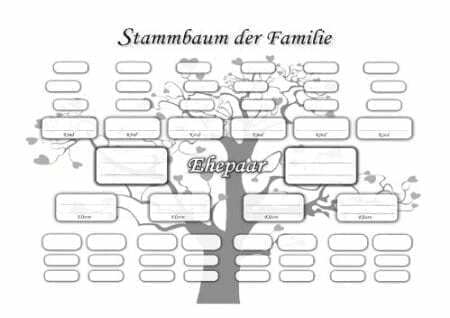 Written and illustrated for children… they are in German! This brings back many memories. Every child could recite the Knecht Ruprecht verse. It usually was performed in a school Christmas play. I remember the second line as: Ich muss Euch sagen es Weihnachted SEHR! Meaning it’s starting to look like Christmas!